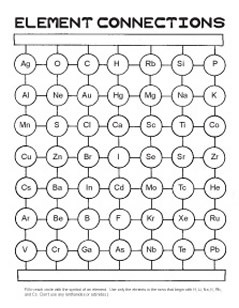 To review information about the Periodic Table and the elements. This is best done as a review game at the end of a unit, when you have already taught about atomic numbers and weights, family groups on the Table (alkali metals, transition metals, etc. ), and some basic facts about the more common elements. This is a Bingo-type game where clues are read and players put tokens on element symbols. The difference between this game and regular Bingo is that the board contains 47 squares, and to win you make a connection from top to bottom, not necessarily in a straight line (more like an electrical connection). A copy of the game board for each student (regular paper is fine), enough tokens so that each player has about 45 (suggestions: pennies, small candies, cereal bits, squares of paper), and Periodic Tables that the students can use for reference during the game.